The landscaping is usually one of the most important aspects of any home renovation project, and that is usually because your home’s landscaping is one of the first things that people are going to see when they see your home. There are a number of great ways to enhance the beauty of your home’s landscaping, but there are few projects that can bring the same kind of life and beauty to your landscape as a high quality, professionally installed water feature. When it comes to landscaping water features, waterfalls and ponds are easily the most popular, and also some of the most beautiful. Water features can do a great bit more than just help you improve the beauty of your property, however. The sounds of running water have been proven to have a calming effect and help to reduce stress levels, which is something that most of us could use after a long day at work. Adding a professionally constructed water feature to your home’s landscaping might just be one of the best investments you ever make for your home, but in case you are still on the fence about it, our team of Virginia Beach landscaping professionals have taken the time to put together this short list highlight just a few of the many benefits that a new pond or waterfall feature can have on your home’s landscaping. 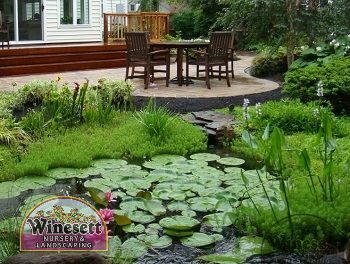 Adding a well designed pond or waterfall feature to your home’s landscaping can actually provide you with a pretty significant boost to the overall value of your home. If you are looking to maximize the beauty of your property, a new water feature for your home’s landscaping could be exactly what you’ve been looking for. Ponds and waterfalls come in a wide variety of different styles, materials, and designs, so no matter what kind of design you are going for with your property, there is an option out there that will perfectly compliment it. Homes in the Virginia Beach area that incorporate pond or waterfall features in their landscape design have actually been known to hold higher property values that comparable homes that just haven’t put the same kind of care into their landscape. As you likely know, anything you can do to keep the value of your home high is usually something that it is worth your time to consider, but this can especially be the case if you are looking to sell your home anytime in the near future. In addition to the increase value that adding one of these particular water features will immediately add to your home, they can also make your home that much more attractive to any potential buyers, and might even be the difference between someone making an offer on your home, or choosing to make an offer elsewhere. 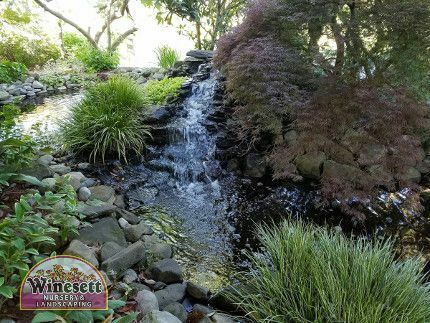 One of the greatest things about a new pond or waterfall feature on your property is that is can be a great way to help diminish the noise pollution that comes from your surroundings, helping you transform your outdoor spaces into the serene escape that you’ve always wanted them to be. The sounds of running water can provide you with a soothing alternative to the annoying sounds that sometimes invade your backyard, like traffic or construction. This can be especially beneficial if your home is located near a busy street, or if you have cars that are frequently racing by or blaring loud music. A new pond or waterfall feature can help you suppress those noises and keep your backyard as a relaxing area for you and your family. If you would like to add a water feature to your landscaping in Virginia Beach, call 757-426-7880 or complete our online request form.